Any reader who notes the similarity between this description and the title of Daniel Everett's book, Don't Sleep, There are Snakes: Life and Language in the Amazonian Jungle, has made the exact connection Wolfe hopes to draw, for after a fairly sudden shift, he centers the rest of the book on two linguists he casts as modern-day opponents: Everett, playing the noble role of "fly-catcher," and Noam Chomsky, acting as the less than fair academic gentleman. Here, Wolfe constructs a kind of David and Goliath narrative where Everett courageously challenges Chomsky's concept of Universal Grammar (UG), his acclaimed and influential theory that humans are hardwired with an innate capacity for language. A little history is important here: Everett began to question Chomsky's notion of UG after evangelizing (he first studied linguistics at Moody) to the Pirahã, an Amazonian tribe whose language seems to refute several assumptions at the heart of the theory. For example, the Pirahã language has little concern for time, an astonishing fact, especially if your theory relies on language universals such as tense. The Pirahã language also seems to neglect making use of recursion—the ability to fit multiple clauses within each other like Russian nesting dolls—a linguistic feature that has taken on more significance in Chomsky's recent work. The result of Everett's challenge to UG has thrown the field of linguistics into some turmoil. In a New Yorker article published in 2007, Steven Pinker referred to Everett's work as "a bomb thrown into the party." Unfortunately, though, rather than delving into this interesting debate, Wolfe expends more of his attention and prose on Chomsky's character as an influential academic than on his actual theories and their potential oversights. For while Wolfe remains convinced that Everett has the truth of the matter, for him Chomsky's greatest sin has less to do with being wrong than 1) doing his work in an office rather than out in the dangerous world, and 2) having enormous influence in the field of linguistics (and academia in general). The first charge sounds almost comical, but Wolfe is dead serious. Over and over he satirizes Chomsky not just as an academic in an ivory tower but as one who is afraid to leave his air-conditioned office (Wolfe is practically obsessed with Chomsky's air-conditioning). By contrast, Wolfe summarizes much from Everett's book, especially relating to his and his family's near-death experiences among the Pirahã. Wolfe here intentionally echoes his description of Darwin sitting behind a desk, thinking, while Wallace battles malaria in Asia. To me, Wolfe's second objection concerning Chomsky's dominance in the field of linguistics has more bite, but here he misses some important facts. First, plenty of scholars have taken issue with UG. True, Wolfe is right about the fairly wide consensus concerning the basic premise of Chomsky's major theory, but not for a moment does he consider that this might just be because there's something to it. Instead, he maintains that the cult of Chomsky has basically cut off contemporary linguists (who like Chomsky enjoy their offices and AC far too much) from entertaining contrary theories. In fact, his portrait of the linguistic community as largely adhering to Chomsky's claims overlooks the disagreement among academics over several aspects of Chomsky's thinking, especially given his more recent directions. For example, Steven Pinker, who wrote an entire book making a case for language as an innate capacity, has of late argued against Chomsky's ideas concerning both syntax and recursion. All of this to reiterate the point that rather than spending time substantially wrestling with Chomsky's ideas, Wolfe spends more time giving us too simple a version of Chomsky's character and his work. Conversely, he simply accepts Everett's belief that speech is more akin to a human artifact, and then adds his own conjecture that cultures developed language primarily as a mnemonic device. Never does he engage with the kinds of questions that challenge this view: If speech is an artifact, why do children learn it so easily, even without direct instruction? Why do so many—if not all—of the world's languages share so many similar features? How do we account for the fact that children produce perfectly correct grammatical constructions, even ones they've never heard before? Rather than engage with these questions, Wolfe simply reiterates his belief in speech as "the primal artifact" and ends his book with what he takes to be an original insight related to this. He writes, "One bright night it dawned on me—not as a profound revelation … but as something so obvious, I could hardly believe that no licensed savant had ever pointed it out before. There is a cardinal distinction between man and animal … namely, speech." Of course, plenty of people have made this observation, and doing so hasn't forced them to take a definite stance on the origins of language. Christians—both evolutionary theists and non—have long believed that as a gift from God, language allows humanity to share in God's creativity and binds us together as bearers of God's image, distinct from other creatures. Not coincidentally, the more Daniel Everett studied the Pirahã language and understood it as so dissimilar from other languages, the less he believed, until his faith evaporated completely. For Everett, unable to even conceive how to translate the gospel's message into Pirahã, believed this tribe's worldview to be definitively incongruous with his own faith. Something had to give, and it wasn't his belief in Pirahã's unique properties. 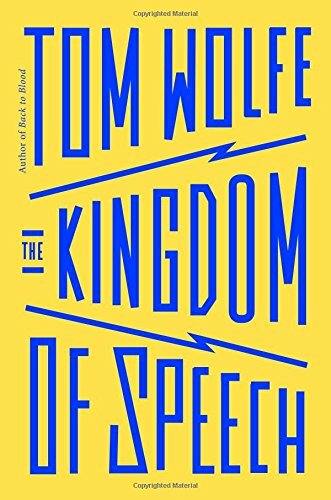 In The Kingdom of Speech, Wolfe writes that Everett is the only outsider to ever have mastered Pirahã, but that's not entirely accurate. In 2002, Daniel Everett left the wilderness and returned to academia; his wife Keren, however, remained, continuing to try to understand this difficult language. In the aforementioned New Yorker article, Daniel Everett discusses his ex-wife's work trying to dissect Pirahã by paying special attention to its prosody: "Keren has made tremendous progress, and I'm sure she knows more about musical speech than I do at this point … . There's probably several areas of Pirahã where her factual knowledge exceeds mine." According to him, though, Keren's insights are skewed because of her "missionary impulse." That is, she continues to try and make sense of the language as a path toward communicating the gospel. Given Wolfe's views on religion, I doubt he would approve of Keren Everett's motivation. Still, he'd have to admit: she avoids staking a claim in the kingdom of power. Or to put it more bluntly, amid all the academic posturing, she makes a pretty good fly-catcher. Andrew Zwart is Instructor of English and Interdisciplinary Studies and Director of Academic Support at Kuyper College in Grand Rapids, Michigan.